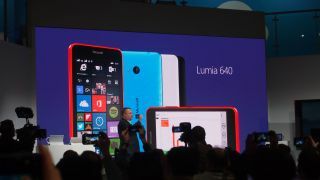 Microsoft's Stephen Elop on stage at MWC. If you've been watching the Microsoft news coming out of MWC 2015 then you'll know that the Redmond firm has been showing off two decent but very mid-range handsets to the crowds. So where's the flagship device? On the way, that's where. The company has confirmed that several high-end Microsoft phones are in the pipeline, though it wants to make sure Windows 10 is set to go before revealing them. We've waited a long time for a new top-end, high-spec, Windows-powered phone but it makes sense that Microsoft wants to bring it into the light of day at the same time as its next major software update. Executive Vice President of Microsoft Devices Stephen Elop said Windows 10 phones would be coming "later this year" and also confirmed that any handset rocking Windows Phone 8.1 would get a free upgrade, including the just announced Lumia 640 and 640 XL. That's good news if you're using an existing phone, but be warned - Elop said that some features may not be available on older hardware (presumably in the same way Apple hobbles iOS on the less powerful iPhones). Elop also spoke about providing solid Microsoft experiences on iOS and Android, and emphasised the ease with which Windows 10 can jump from one device to another. We're expecting to see Windows 10 sometime in the summer or the autumn.